Every 83 seconds someone uploads an anti-Semitic post on social media. Young people everywhere are growing up in an increasingly anti-Israel, anti-Semitic culture. 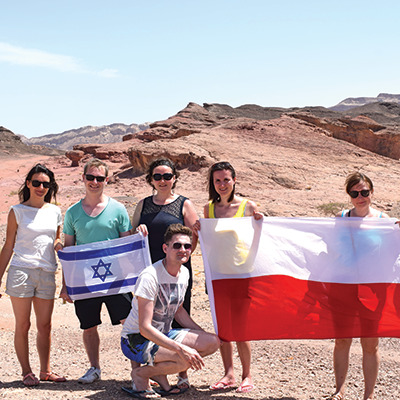 Living Bridges is a growing program that takes young Christians from Poland to the land of Israel. Why is this important? Because sadly, anti-Semitism permeates Eastern Europe, which now mirrors the society of pre-World War II. Our Eastern European representatives are working tirelessly to change the anti-Semitic views of the next generation. Through Living Bridges, young people serve the Jewish people and experience a life-changing trip to the Holy Land. They see how Jewish people live, thrive, and strive for peace in their homeland. Our hope is that the Polish young adults return home forever changed as true friends and advocates of Israel and the Jewish people. If you would like to help stop the growth of anti-Semitism in Europe one life at a time, you can sponsor a young adult’s trip to Israel.